This entry was posted in Vacuum Tubes and tagged 6080/ECC230, Mullard by tubemaze. Bookmark the permalink. I’ve been using Tung-Sol 5998 for quite a while and found it to be a very good sounding tube – relaxed, airy, transparent with great bass. 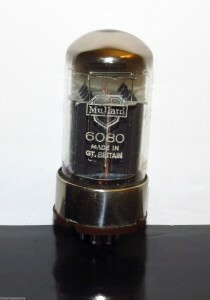 Then I came across a few sets of Mullard 6080 tubes. These appeared to be genuine. Black spiky plates, made in Gt. Britain, Mitcham factory codes starting with R. I was very excited to try them out. So there they went – right into the amp. The music started, my brain froze and started to struggle with the information. At first I rejected my first impression, so I put Tung-Sol back – listened more and then Mullards. I couldn’t believe it, but Mullard tube sounded better!!! It reproduced body of the sound in such a rich way that Tung-Sol sounded dry in comparison. Full, powerful, maybe not as transparent as Tung-Sol, but by just a tiny bit. The tube became my new reference tube. HIGHLY RECOMMENDED. I have a Mullard Mitcham rebranded Philips 6080 tube and it sounds weak. This compared to my Philips JAN 6080WC tube, it has better tonality and bass compared to the Mullard made tube.